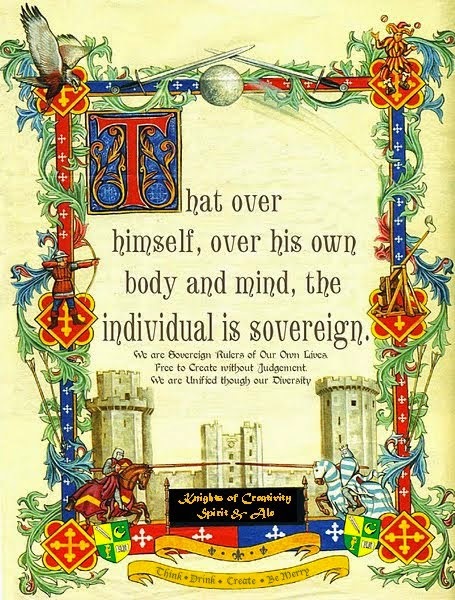 Knights of Creativity Spirit & Ale: It's not everyday that, while driving to work in your truck, you run over and kill a goat. It's not everyday that, while driving to work in your truck, you run over and kill a goat. Fortunately, this was not one of those days... again! And Springtime traditionally means Bock beers: a bottom fermenting lager that generally takes extra months of lagering (cold storage) to smooth out such a strong brew. Bock beer in general is stronger than your typical lager, more of a robust malt character with a dark amber to brown hue. Hop bitterness can be assertive enough to balance though must not get in the way of the malt flavor, most are only lightly hopped. I'm not exactly sure the true origins of Bock beer. I have read that in medieval days German monasteries would brew a strong beer for sustenance during their Lenten fasts. Some believe the name Bock came from the shortening of Einbeck thus "beck" to "bock." I do know that this beer has become a symbol of better times to come and moving away from winter (though it was also brewed for other special occasions and religious festivals such as Christmas). According to an article written by Jay R. Brookal: March used to signal the end of the brewing season in the days before refrigeration, when the weather became too warm to brew. In Germany, they brewed beer for Oktoberfest, known as Marzen — German for March — in the waning weeks of the season. It was then laid down to age until it was ready, just in time to celebrate Oktoberfest. 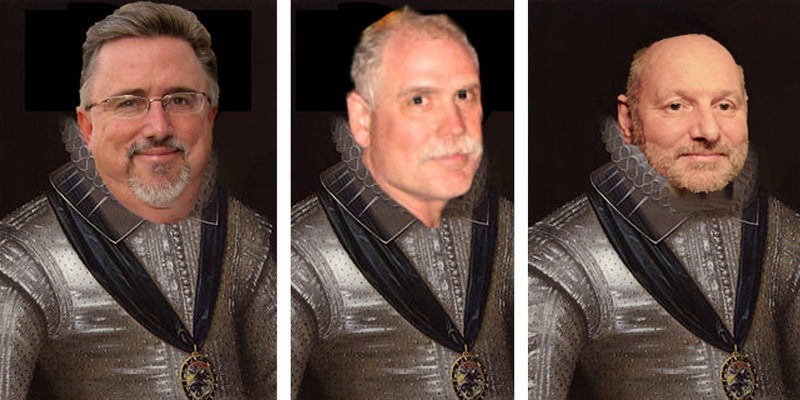 Today, of course, marzens are made year-round. Similarly, in France and Belgium, they brew a beer known as Biere de Mars, or March beer. It's similar to the Biere de Garde style — light and malty with a hint of spices — but is meant to be enjoyed immediately and not aged for any length of time. 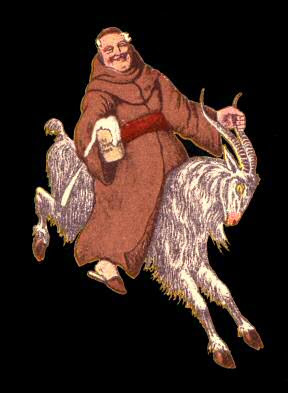 Others believe it is more of a pagan or old world influence that the beer was only to be brewed during the sign of the Capricorn goat, hence the goat being associated with Bock beers (There is another explanation below). This poster is one of a series of reprints of original advertising used in the early 1900's by the Spaten Brewery. The discovery of these vintage advertising posters was found buried deep in their warehouse in Germany. German's rank their bockbiers as the most malty and heaviest lagers in the world and warn they are to be sipped not guzzled. Generally little hop aroma in the nose or on the finish and little bitterness, with colour that can range from blond to black. 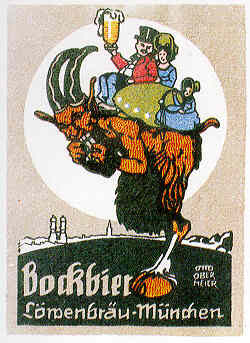 Many Bock beers feature imagery of goats on the label. Bock means billy goat in German. 1882 Early American Bock Beer bar poster. Yes, it's Springtime. Go Bock and have another beer! Well you convinced me to ditch my beloved dark brews this weekend and search for a good stiff clean Bock at the hypermart... I love things that are "in season", its the natural way to live. The uTube video was wild! How that car didn't roll I don't know? 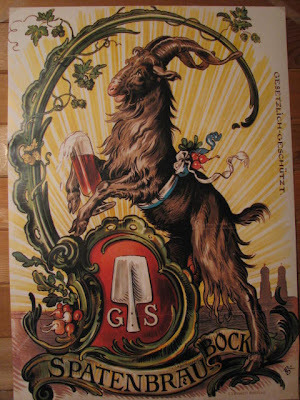 Love the old Goat Bock posters! Not a fan of Bock beer though, sorry!